Canine Health Nutrition Junior is a wet food for small breed dogs which weigh up to 10kg at maturity and are up to 10 months old. This food has been specially formulated to stimulate the appetite of young, small breed dogs. Small dogs (up to 10kg - adult weight) up to 10 months old. Meat and animal derivatives, cereals, oils and fats, derivatives of vegetable origin, minerals. Nutritional additives :vitamin D3 :118 UI, E1 (iron) 6.5 mg, E2 (iodin) 0.2 mg, E4 (Copper) 1.9mg, E5 (Manganese) 2 mg, E6 (zinc) 20mg. Protein 9%, fat content 6% , crude ash 1.5%, crude fibres 1%, moisture 80%. The following tables show the recommended daily feeding quantities (cans per day). Fresh water should be available at all times. Below are some recent questions we've received regarding Royal Canin Canine Health Nutrition Wet Junior Dog Food, including answers from our team. 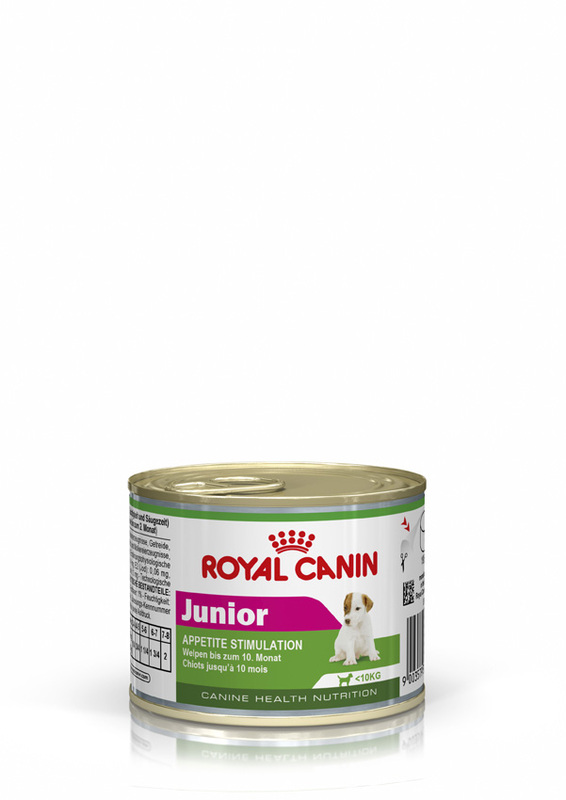 royal canon junior wet food...can this be mixed with the royal canon dried food ? Yes the 2 can be mixed. Both are complete diets in themselves, so they can be mixed in whatever proportions you want. They can be fed together at the same time, or at different times.